Sunday Breakfast Buffet 8:00 a.m. - 1:00 p.m. Served with hash browns or home fries and toast, dollar pancakes, warm tortilla or biscuit. 8 oz. pub steak and two eggs any style. Two eggs, bacon, and cheddar-jack cheese on grilled sourdough. Eggs, sausage, home fries, all scrambled together with cheese. Served with sour cream, salsa and a tortilla. Eggs and ham on an English muffin with hollandaise sauce. Grilled corned beef hash with two eggs any style, no hash browns. Fresh hand breaded cube steak with our country gravy. Two biscuits and gravy with hash browns. One biscuit and gravy, two link sausages, two eggs and hash browns. Crispy potatoes, ham, scrambled eggs & hollandaise sauce wrapped in a warm tortilla. Served with tomato slices. One egg, two strips of bacon, hash browns and toast. Two-thirds pound lean ground beef. Grilled the way you like it. Two eggs with choice of bacon, sausage, Polish sausage or ham. Served with shredded jack and cheddar cheese, toast and either hash browns or home fries. Seasoned ground beef, jalapenos, cheese, lettuce, tomato, salsa and sour cream. Ham, onions, mushrooms, green peppers and salsa. Your choice of sausage, bacon or ham with cheese. Green peppers, onions, jalapenos, sausage, salsa and sour cream. Two egg omelet, no cheese, with toast. Topped with our own homemade chili. Pancakes are served until noon Monday-Friday and 1:00 p.m. on Saturday and Sunday. French Toast is served until noon Monday-Friday and 1:00 p.m. on Saturday and Sunday. Freshly fried flour tortilla chips with zesty cheese sauce, olives, tomatoes, onions and jalapenos. Crispy seasoned fries loaded with melted cheese. A grilled flour tortilla loaded with chunks of tender seasoned chicken breast and melted cheese, with salsa and sour cream. Seasoned and crispy tots topped with melted cheese. Our already delicious cheese fries smothered with our homemade chili. Two vegetable and pork eggrolls served with sweet and sour sauce. A pile of battered onion rings. Grilled chicken breast, peppers, onion, shredded cheese and Southwest sauce wrapped in grilled tortilla. A freshly made tortilla bowl filled with lettuce, taco meat, cheese, tomatoes, olives, onions, jalapenos, salsa and sour cream. Grilled chicken breast, steamed broccoli, mushrooms and onions with hard boiled egg, tomato and pickle. Our great salad bar plus a cup of home made soup. As a meal, enjoy all the selections of our salad bar. Lettuce, tomato, carrots, olives, croutons and your choice of dressing. Turkey, ham, cheese, hard boiled egg, mushrooms, pickles, tomatoes and lettuce. Each of these tasty treats can be made with either a lean grilled chicken breast or juicy beef patty. Served with onion, tomato, lettuce, pickle and your choice of a cup of soup, dinner salad, fries, tots, potato salad or chips. Delicious burger on grilled rye with Swiss cheese and grilled onion. Topped with American cheese, onion ring, bacon and BBQ sauce. 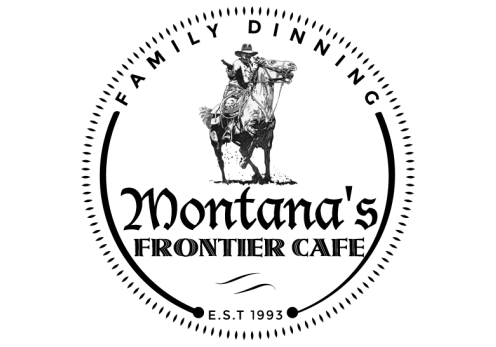 A Frontier favorite, topped with smokey bacon and melted cheese. Served with your choice of cup of soup, dinner salad, fries, tater tots, potato salad or chips. Grilled steak, green peppers, onions, mushrooms and Swiss cheese on a hoagie roll. Tender sliced roast beef on a hoagie roll with au jus. Roast beef, grilled onions, cheddar jack cheese on a hoagie roll with au jus. Albacore tuna, minced onion & celery, boiled egg and crisp sprouts on French bread. Grilled turkey, bacon, tomato and American cheese on grilled sour dough. Roast beef, sauteed mushrooms and Swiss cheese on French bread with au jus. Seasoned ground beef, lettuce, tomato, cheese, salsa and sour cream all wrapped in a warm tortilla. Golden chicken strips, bacon, tomatoes, lettuce & Swiss cheese on a hoagie roll. Sliced roast beef, ham or turkey with lettuce, tomato and cheese on your choice of bread or hoagie roll. A classic egg salad sandwich with bacon, lettuce and tomato added. Thin sliced pastrami, Swiss cheese, sauerkraut & Thousand Island dressing served on beautiful marbled rye bread. Crispy chicken strips with fries and coleslaw. Deep fried and crispy shrimp with fries and coleslaw. Deep fried beer battered cod, fries and coleslaw. Ham, turkey or roast beef with a cup of soup. Just a smaller version of our oh so good burger. Crispy chicken strips with dinner salad or cottage cheese. twice baked potatoes, mashed, baked potato, fries, hash browns or rice pilaf. Choice pub steak, char-broiled the way you want it. Our delicious pub steak with a generous portion of shrimp. Two-thirds pound char-broiled lean ground beef, served with grilled onions and brown gravy. Fresh, hand breaded cube steak with our country gravy. Made right here and SO delicious! Four delicious pieces of golden fried chicken, seasoned just right. Juicy chicken breast with sauteed mushrooms & onions in a marsala wine butter sauce. Grilled sliced liver, gravy, sauteed onions and bacon. Two boneless loin chops served with applesauce. A large flour tortilla filled with seasoned ground beef, shredded cheese, lettuce, tomatoes, onions and black olives. Smothered in our red Matador sauce. Boneless chicken breast perfectly grilled. A generous portion of golden breaded shrimp. Beer battered and deep fried cod. Tender and flaky salmon filet grilled with lemon, to perfection. Stir fried teriyaki chicken, Oriental style veggies on rice pilaf, served with an eggroll. Not served with soup or salad. Oriental style veggies served on rice pilaf and tomato slices. With mashed potatoes, gravy and veggies. With gravy, grilled onions, mashed potatoes and veggies. Beer battered cod with potatoes and veggies. If you don't see your favorite flavor listed, we may have it, just ask your server. Chocolate or Decadent Hot Fudge. Fresh assorted cream and fruit pies. Tired of French fries? Upgrade to onion rings or one trip salad bar for just $1.00. Dinners are served from 4p.m. until closing Monday - Saturday and noon until closing on Sunday.